BACKGROUND AND PURPOSE: Inflammatory multiple sclerosis (MS) lesions are characterized by microglia activation and infiltration of T cells, B cells, and macrophages across the blood-brain barrier (BBB). In the experimental autoimmune encephalomyelitis (EAE) rat model of MS, previous MR imaging investigations with a new contrast agent ultra-small-particle iron oxide (USPIO) that accumulates in phagocytic cells revealed in vivo the presence of macrophage brain infiltration. The goal of this study was to characterize MS lesions with the use of this contrast agent. METHODS: A prospective MR imaging study of 10 patients with MS in acute relapses was achieved by using USPIO and gadolinium. RESULTS: Twenty-four hours after USPIO injection, 33 acute MS lesions in 9 patients showed USPIO uptake. Lesions were seen as high signal intensities on T1-weighted images and low signal intensities on T2-weighted images. Gadolinium enhancement was seen in 31 of these lesions in 7 patients. These 7 patients presented 24 gadolinium-enhanced lesions that did not enhance with USPIO. Two patients showed USPIO-enhanced lesions but no gadolinium-enhanced lesions. CONCLUSION: Taken together with earlier findings obtained in experimental models or in human stroke, the visualization of macrophage activity in vivo with USPIO characterize a distinct cellular and inflammatory event of the dynamic process of MS lesion formation. The macrophage activity information obtained with USPIO is distinct and complementary to the increased BBB permeability seen with gadolinium. To specifically investigate the CNS infiltration of macrophages in humans during the acute relapse of MS, we prospectively studied 10 patients with MS with the use of MR imaging and USPIO. We also compared, in the same patients, MS lesion enhancement by gadolinium, a marker of increased BBB permeability. The present study shows the ability of MR imaging to monitor in vivo the macrophagic activity and illustrates the heterogeneity of inflammatory MS lesions. The USPIO contrast agent used in this prospective, single-center, open-labeled clinical phase IIa study was Sinerem (Guerbet Laboratory, Aulnay, France). A dose of 2.6 mg Fe/kg was administered intravenously at a slow rate over a 30-minute period. A control safety of adverse effects was achieved during the infusion and up to 24 hours after. We prospectively investigated 10 patients (8 women and 2 men) with clinically diagnosed remitting-relapsing MS during the time of one clinical relapse. Inclusion criteria were: adulthood; a history of relapsing-remitting definite MS; development of a relapse of MS lasting for between 48 hours and 14 days; a scheduled hospitalization that would last for at least 24 hours after USPIO injection; and informed written consent to participate in the trial. Noninclusion criteria were: progressive MS; presence of contraindication to MR imaging; current treatment with an immunosuppressive drug or with interferon (this criterion was considered only after the recruitment of 5 patients currently treated with immunosuppressive drug or with interferon to ensure the recruitment of at least 5 untreated patients). The mean age of the 10 patients was 40.8 years. None of the 10 patients had received steroids within the 6 months before the relapse of MS. No steroids were given to treat the relapse before the end of the protocol. Six patients had not been treated with β-interferon therapy or immunosuppressive therapies for the past 6 months. At the time of the relapse, 3 patients were receiving β-interferon therapy and one patient was receiving immunosuppressive therapy. The mean score of expanded disability status scale (EDSS) was 3.8 (minimum 2, maximum 6). MR imaging studies were performed during one relapse of a mean duration of 7.4 days after the onset (minimum 2, maximum 14 days). All patients agreed to participate in this study by signing the approved informed consent form. MR imaging studies of the brain followed the recommendations for correct repositioning.25 The MR imaging protocol consisted of a T1-weighted sequence (spin-echo, repetition time [TR] = 494 ms, echo time [TE] = 12 ms) with a magnetization transfer pulse to enhance contrast between enhanced and nonenhanced tissues (on resonance composite block pulse 90°-180°-90°; B1 field = 21 μT, duration = 1.1 ms), and 3 T2-weighted sequences (turbo-spin-echo [TSE] TR = 4347 ms, TE = 100 ms; fluid-attenuated inversion recovery [FLAIR] TR = 1100 ms, TE = 140 ms; gradient echo T2*, TR = 700 ms, TE = 21 ms, flip angle [FA] = 15). T2*-weighted images were used to enhance the blooming effect of USPIO. All sequences had 22 5-mm thick sections and were identically positioned in the axial direction. Two MR imaging studies were performed on each patient. The first MR imaging (MR imaging 1) included the protocol described above associated with a T1-weighted sequence after intravenous administration of 0.1 mmol/kg gadolinium chelates (Dotarem; Guerbet, Aulnay, France). Two hours after MR imaging 1, USPIO was administered. Because the presence of USPIO in the CNS mediated by phagocytic cells requires at least several hours,26 the second MR imaging (MR imaging 2) using the same protocol as applied for MR imaging 1 was performed 24 hours (±2 hours) later in all 10 patients with the MR imaging protocol described above. MR images were read independently by 2 neuroradiologists in 2 separate reading sessions. The numbers of USPIO-enhanced lesions and gadolinium-enhanced lesions were determined for each patient. Lesions enhanced by USPIO were determined as increased signal intensity on T1-weighted images and as decreased signal intensity on T2-weighted and T2*-weighted images. Lesions enhanced by gadolinium were determined as increased signal intensity on T1-weighted images. The results of both readings were compared, and in the case of discrepancy in numbering of the lesions, an agreement between the 2 neuroradiologists was obtained by a common reading during a third reading session. In addition, to evaluate the influence of treatment on USPIO and gadolinium uptake, we calculated the number of lesions in previously untreated patients (n = 6) and in those of the patients who were under long-term treatment (n = 4). We performed MR imaging of MS brain lesions by using USPIO and gadolinium chelates in 10 patients in acute relapse. No significant side effects were noted with either contrast agent. On MR imaging 2, performed 24 hours after USPIO injection, 9 of the 10 patients presented 33 USPIO-enhanced lesions on T1-weighted images (Figs 1H, 2D, and 3B). Six of these lesions were clearly seen to have low signal intensity on USPIO-enhanced T2-weighted images (Figs 1F and 2C) and T2*-weighted images (Fig 1G). In these lesions, both the high signals on T1-weighted images and the low signals on T2-weighted images were at the same location. Blood vessels, mostly veins, were seen only on T2*-weighted images as dark signal intensity (Fig 1G) corresponding to the circulation of free USPIO particles. No signal intensity change in vessels was seen on T1- or T2-weighted images. Ultra-small-particle iron oxide (USPIO)- and gadolinium-enhanced multiple sclerosis (MS) lesions on several MR imaging sequences. MR imaging 1 performed with fluid-attenuated inversion recovery (FLAIR) (A), T2-weighted (B), T2*-weighted (C), and magnetization transfer T1-weighted postgadolinium images (D). Some MS lesions were enhanced by gadolinium. MR imaging 2, performed 24 hours after USPIO injection, shows an uptake of USPIO in 1 lesion on FLAIR (E), turbo spin echo (TSE) T2-weighted (F), T2*-weighted (G), and T1-weighted (H) images (short arrows). Veins are clearly seen as dark signal intensity on T2*-weighted images (G) (long arrow). Mismatch of contrast agents uptake in an ultra-small-particle iron oxide (USPIO)-enhanced acute multiple sclerosis (MS) plaque. MR imaging 1 T2-weighted (A) and T1-weighted postgadolinium images (B) shows a large MS lesion that was not enhanced by gadolinium. MR imaging 2 shows the USPIO uptake at the periphery of the lesion (arrows), seen as a decreased signal intensity on T2-weighted images (C) and a high signal intensity on T1-weighted images (D). According to histologic observations (Lucchinetti et al, 2000), the number of macrophages at the center of acute MS lesions is usually minor. Mismatch of contrast agent uptake in gadolinium-enhanced acute multiple sclerosis (MS) plaques. MR imaging 1 T1-weighted image (A) revealing the presence of 3 gadolinium-enhanced MS lesions (arrows). MR imaging 2 T1-weighted image (B) reveals USPIO enhancement in only one small lesion (arrow). Gadolinium enhancement was detected in 55 MS lesions of 7 of 10 patients (Figs 1D and 3A). The 3 other patients showed no gadolinium enhancement. 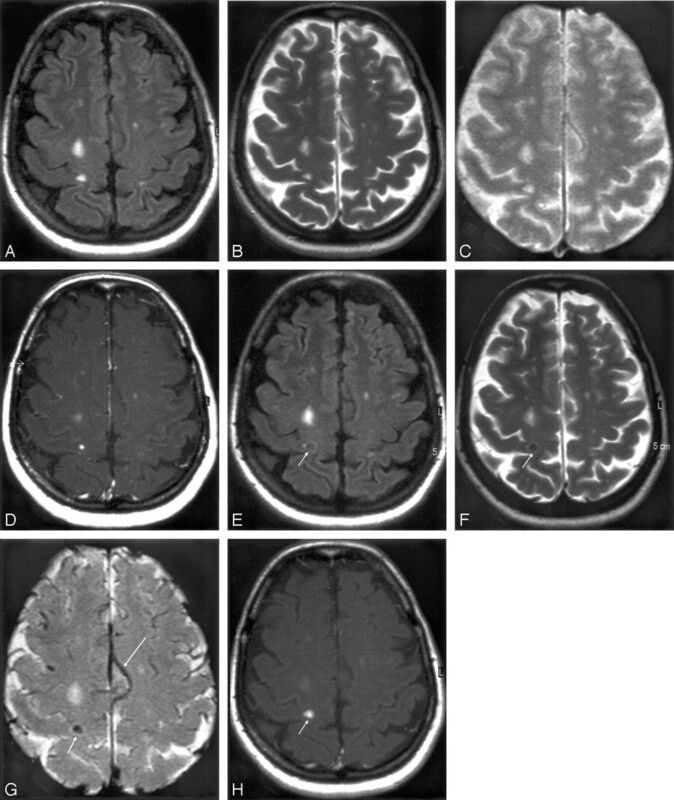 Thirty-one MS lesions were enhanced by both contrast agents (Figs 1 and 3). 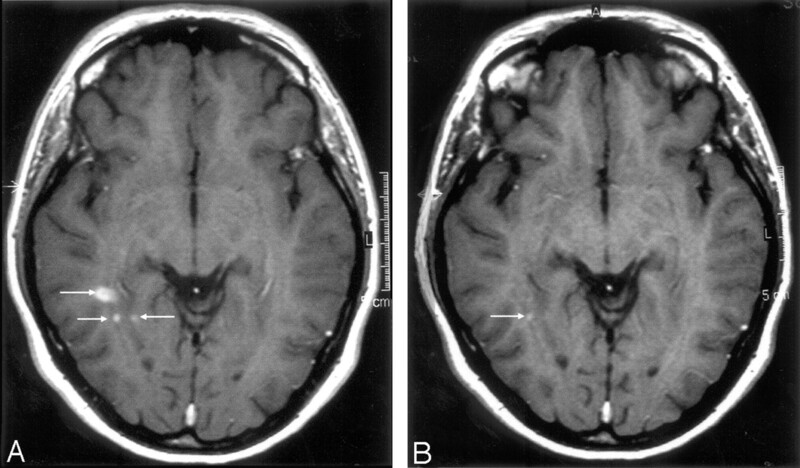 Twenty-four MS lesions were enhanced by gadolinium only (Fig 3). Two USPIO-enhanced brain lesions were observed in 2 patients who showed no gadolinium enhancement (Fig 2). In 1 patient, no lesions were enhanced by gadolinium or USPIO. The 4 patients receiving long-term therapy with either β-interferon or immunosuppressors showed 13 USPIO-enhanced lesions and 25 gadolinium-enhanced lesions. The findings were similar in the group of untreated patients (n = 6) that presented with 20 USPIO-enhanced lesions and 30 gadolinium-enhanced lesions. Table 1 summarizes the quantitative comparison between USPIO-enhanced lesions on MR imaging 2 and gadolinium-enhanced lesions on MR imaging 1. Our study shows for the first time the ability to detect in vivo, by MR imaging with USPIO, monocyte/macrophage infiltrates in inflammatory MS brain lesions. With both contrast agents, gadolinium and USPIO, different features of the CNS inflammatory process were observed, providing in vivo evidence that regional infiltration of inflammatory cells can be monitored in the presence or absence of increased BBB permeability that facilitates the diffusion of gadolinium. This MR imaging approach using both contrast agents provides a new characterization of the heterogeneity of inflammatory MS lesions. MS usually begins as a relapsing-remitting process, but as one CNS attack follows another, disability accumulates; ultimately, the illness becomes relentlessly progressive.4 MS lesions can be characterized pathologically as active or inactive based on the presence or absence of various inflammatory cell types.2,12 One criterion to determine MS lesion activity is the presence of myelin degradation products in macrophages. This feature predominates in active lesions presenting hypercellular and patchy infiltrates of autoreactive T cells.5,27 Another important feature of inflammation is the infiltration of T helper 1 cells and macrophages. Phagocytic cells that are resident microglia and blood-borne macrophages play important roles in balancing the immune reaction, in the attack of myelin, and in the removal of myelin debris.28 Demyelination mediated by other factors, such as humoral auto-antibodies secreted by B cells, is also associated with macrophage activity in both marmoset EAE29 and human MS.30 In vivo techniques that display the cellular component of inflammation would help in the understanding of the dynamic process of MS and in the therapeutic strategy for individual patients. In correlation with these morphologic characteristics of active MS lesions, MR imaging investigations provide complementary in vivo information. The strengths of MR imaging are (1) to provide an in vivo insight in MS pathophysiology, (2) to follow the natural history of the disease, and (3) to evaluate the efficacy of treatments.6,7 T2-weighted sequences investigate the water content in tissues and T1-weighted or magnetization transfer sequences observe the relationship between water and macromolecules in membranes.31,32 Contrast agents such as gadolinium chelates can reveal the presence of BBB disruption in MS lesions, thus characterizing one feature of inflammation.8 However, so far, no MR imaging or other imaging techniques have allowed us to determine in vivo the cellular component of inflammation. The present study tracks in vivo the infiltration of blood-borne macrophages into MS lesions by using USPIO. All USPIO-enhanced lesions were seen on T1-weighted images; fewer were also seen on T2-weighted images. In other studies conducted at comparable magnetic field strengths in human tumors,33 EAE rats,18 and human ischemic stroke,34 USPIO was detected on T1-weighted images as areas of high signal intensity, making these agents ideal for accurate cellular imaging in clinical practice. An increased signal intensity on T1-weighted images at 1.5T has been well demonstrated in vitro in USPIO-loaded cells.35 Conversely, free USPIO particles still present in the bloodstream 24 hours after injection were not detectable on T1-weighted images and T2-weighted images but produced a strong loss of signal intensity in vessels on T2*-weighted images. It might be that lesions showing both T1 and T2 signal intensity alterations as a result of USPIO were likely to contain higher amounts of USPIO and more important phagocytic cell infiltrates than lesions showing T1 signal intensity alteration alone. However, on T2-weighted images, only lesions demonstrating clearly low signal intensity were detectable. 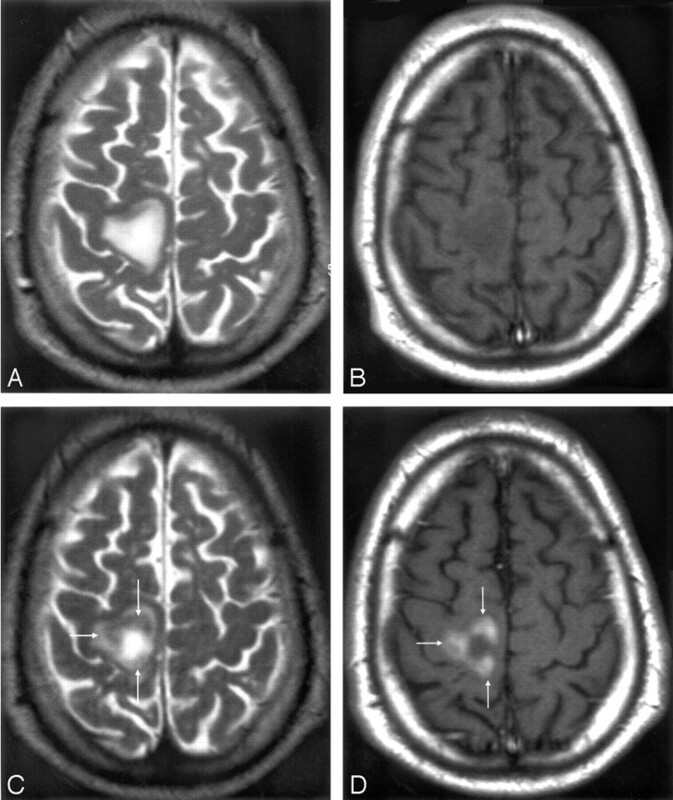 Thus, several lesions with USPIO uptake detected in T1-weighted images might have been missed on T2-weighted images because of the difficulty in assessing a minor or moderate drop of signal intensity on lesions still remaining with a high signal intensity compared with the surrounding normal white matter. No histology could ethically be performed in the patients with MS in this study. However, based on the results obtained on EAE rats, we hypothesize that USPIO enhancement was derived from migrating USPIO-loaded monocytes crossing the BBB in response to inflammatory chemokines. The pharmacokinetic behavior of USPIO is to accumulate several hours after intravenous injection in cells of the mononuclear phagocytic system, especially in the macrophages of the lymph nodes and spleen.19–21 Several experimental studies have demonstrated the incorporation of USPIO by phagocytic cells in EAE,13–17 in experimental brain ischemia,22,24 and in experimental brain tumors.36 The detection of USPIO in phagocytic cells within brain lesions of the rat animal model of MS emphasized the potential of this experimental approach to visualize in vivo monocyte cell infiltrates in human MS by MR imaging. In the human CNS, USPIO has been used to delineate brain tumors33 and to show macrophages in ischemic stroke.34 Our findings indicate that the USPIO contrast agent can reveal with high sensitivity the presence of phagocytic cells in MS lesions. MR imaging with gadolinium and USPIO revealed a total of 57 enhanced lesions, 31 of which were detected with both contrast agents. The remaining 26 lesions showed 2 specific enhancements, one with gadolinium only (n = 24) and the other with USPIO only (n = 2). The 2 lesions that showed enhancement with USPIO alone present the feature of phagocytic activity in brain, without detectable BBB permeability. Because these 2 patients were negative for gadolinium enhancement, active inflammatory lesions would not have been diagnosed. Observations of inflammatory acute MS lesions that do not enhance with gadolinium have already been made using other MR imaging or MR spectroscopy techniques.10 Similar findings were observed in the rat EAE model, where, in acute lesions, USPIO enhancement was present without gadolinium enhancement14,17 and more recently in human ischemic stroke.34 Because the size of gadolinium chelates is a thousand times smaller than USPIO particles, a passive crossing of USPIO is excluded. Thus, our study sustains the hypothesis of USPIO-loaded monocytes actively crossing the BBB. The match and mismatch of both contrast agents’ uptake may indicate that cellular inflow and BBB permeability are spatially or temporally independent. We are aware that the BBB integrity changes as lesions evolve. One can argue that USPIO imaging was performed 24 hours after the MR imaging obtained with gadolinium, allowing permeability changes of the BBB. This hypothesis deserves to design another study with serial MR imaging over a short time period. Delayed scanning or higher doses of gadolinium might have increased the number of gadolinium-enhanced lesions and might have enhanced the 2 gadolinium-negative/USPIO-positive lesions. In this preliminary study, not all the MR imaging modalities used in MS could be compared with USPIO enhancement. Further studies are needed in this respect. Gadolinium enhancement may be interpreted as a sign of an active lesion, but gadolinium may also cross the BBB in inactive chronic lesions.6,9 The biologic compartment of gadolinium, the interstitial space, therefore carries different meaning than the intracellular location of USPIO in phagocytic cells. In our study, lesions with gadolinium enhancement might reveal only BBB permeability without infiltrating phagocytic cells. The precise clinical significance of gadolinium enhancement remains unknown. Although it is considered a predictor with moderate ability for the occurrence of relapses, it is not predictive for cumulative impairment or disability.11 This discrepancy supports the idea that various pathogenic mechanisms are operative in the occurrence of relapses and in the development of long-term disability in MS. Therefore, some inflammatory gadolinium-enhanced lesions may not experience tissue destruction. The MR imaging of phagocytic cells that removes the myelin debris may provide a stronger predictor for MS disease development than the imaging of increased BBB permeability. Longitudinal studies are needed to determine the MS destructive phenomenon in gadolinium- and/or USPIO enhanced lesions. The data provided in this study cannot be generalized to the all patients with MS. More studies are needed to investigate the use of USPIO in the progressive forms of MS. There were no differences between patients receiving long-term β-interferon or immunosuppressors and untreated patients in the ability of both contrast agents to demonstrate the presence of new active lesions in patients with MS relapses. This emphasizes the possibility to combine both gadolinium and USPIO for MR imaging evaluation of therapeutic trials including patients receiving long-term treatment. This study encourages a strategy to monitor in vivo macrophage activity in human diseases with infiltration of monocytes. We thank Drs. S. Gaillard and B. Bonnemain from the Guerbet Group, Dr. V. Sesay from the Department of Neuroradiology, and all the study contributors from the Departments of Neurology and Neuroradiology at the Pellegrin University Hospital, Bordeaux, France, for their helpful discussions, and Dr. J.K.V. Reichardt, USC Los Angeles, for critical reading of the manuscript. This study was supported by “IFR 8 Neurosciences cliniques et expérimentales,” the “Centre Hospitalier Universitaire of Bordeaux” and the “Université Victor Segalen Bordeaux 2.” Financial support was received from Pôle Santé Aquitaine (V.D. ), Conseil Régional d’Aquitaine, Institut National de la Santé et de la Recherche Médicale (K.G.P.). Ethical approval ALS 3-14F from the local ethical committee: “Comité Consultatif pour la protection des personnes et des biens de Bordeaux” according to the applicable French Law.